Maximize your location with choices! 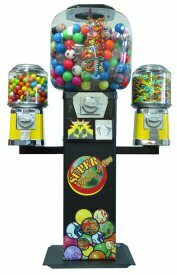 Super 2 Bouncy Ball Machine vends 45 or 49mm size super balls, 2" standard capsules, jawbreakers or gumballs. Holds 590ct. 45mm super balls, 500ct. 49mm super balls, or 500ct. 2-inch gumballs. Add 2 Barrel Machines with 25 cent coin mechanism to vend candy and 1" gumballs and your customers will be thrilled with their options. Hold 10 lbs. of candy or approximately 350 1-inch gumballs.